Dr. David Strayer is a Professor in the Department of Psychology at the University of Utah and Director for the Center for the Prevention of Distracted Driving. He received his Masters degree in Experimental Psychology from Eastern Washington University and his PhD in Experimental Psychology from the University of Illinois at Urbana-Champaign. Afterward, he completed a postdoctoral fellowship at the University of Illinois at Urbana-Champaign and worked briefly as a Member of Technical Staff at GTE Laboratories before joining the faculty at the University of Utah. David has received many awards and honors during his career, including being named a Fellow of the Association for Psychological Sciences, receiving the Interdiscipliniary Teaching Grand Award from the Psychology of Traffic, and being awarded the University of Utah Distinguished Scolarly and Creative Research Award. David’s research has also been featured among Discover Magazine’s 100 Top Science Stories in 2003 and 2005. He has also giving briefings to the US House and Senate on distracted driving issues. David is here with us today to tell us all about his journey through life and science. David prefers to spend his free time outdoors hiking, rafting, and exploring the beautiful scenery of Utah. In the lab, David does applied cognitive neuroscience to understand how attention works in everyday life. His lab studies how people do more than one thing at a time (multitasking), like driving and talking on a cell phone. What really hooked David in science was his first week of introductory psychology where he learned that psychology really was a science. He discovered you could ask some interesting questions about how people think and behave. David’s first dissertation study was a huge failure. The task was too difficult and he just ended up with floor effects. He spent months working on it and then basically had to start all over again from scratch. David and his colleagues worked on benchmarking cognitive distractions during driving in one of the most comprehensive studies conducted. They created a scale for the impact of different distractions and presented it to policy makers at AAA to give recommendations for regulatory bodies in DC. As part of this, David had an opportunity to brief some of the members on the House and Senate on his findings as well. One of David’s most interesting travel opportunities brought together a group of cognitive neuroscientists for a wilderness trip in Utah that left them all unplugged from technology for several days. He is fascinated by how technology might affect how we think and behave so it was fascinating to talk to these scientists around the campfire about the impacts of technology on how people think. David shared some of the crazy stories from the faculty prior to his generation where they would sneak into the department chair’s office at night and cut off a quarter inch off each leg of the desk every night so the desk kept getting shorter. They also would go in at night and switch the doors so that someones key would no longer open the current door to their office. Keep it simple or stupid. This is very important in science for papers and ideas. Your work won’t have the impact it could if you make it overly complicated and it is difficult to communicate. David has been conducting research and publishing on attention and driver distraction for over fifteen years. 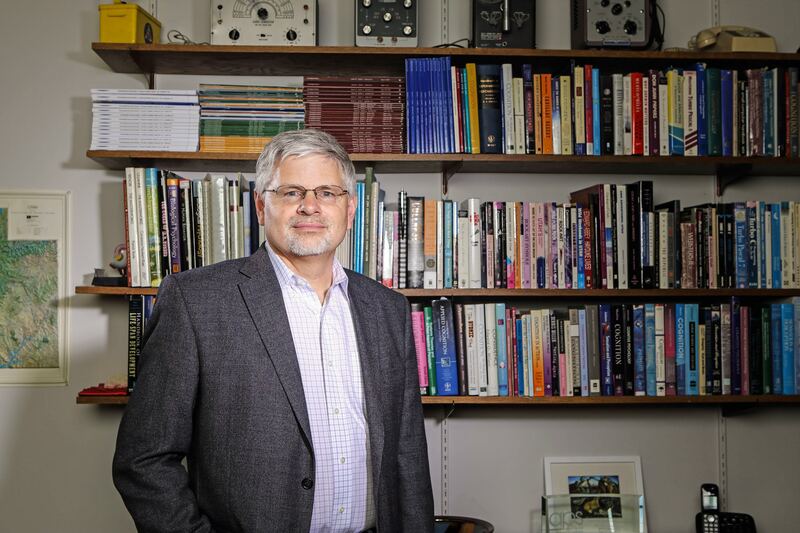 His work examines how attention functions within multiple research domains, from assessing the limits of human multitasking ability while performing complex tasks such as driving, to studying how attentional capacities can be restored by interacting with nature. David’s lab uses converging methodologies to measure changes in both attention and performance, from psychophysiological (EEG and fMRI), subjective ratings, to primary (e.g., driving performance) and secondary task (e.g., reaction time) measures. Here is the link to Gatekeeper task David mentions in his interview: http://psych.newcastle.edu.au/~ae273/Gatekeeper_XOR/ as well as a link to his lab website: http://www.psych.utah.edu/lab/appliedcognition.